Our book just launched and we are very excited about it. It's published by Johns Hopkins University Press and is available in paperback and hardback. We have two fantastic reviews on Amazon from Pete Early (New York Times bestselling author of CRAZY: A Father's Search through America's Mental Health Madness) and Keith Ablow MD (psychiatrist, Fox News contributor, and coauthor of The 7: Seven Wonders to Change Your Life). Finally, a book that explains all you ever wanted to know about psychiatry! What is psychotherapy, how does it work, and why don't all psychiatrists do it? What happens on a psychiatric unit? Does Prozac make people suicidal? Why do many doctors not like Xanax? Why do we have an insanity defense? Why do people confess to crimes they didn't commit? Based on the authors' hugely popular blog and podcast series, the book engages the concerns of patients, psychiatrists, and the general public alike. Through compelling patient vignettes, Shrink Rap explains how psychiatrists think about and address psychiatric problems, from the mundane (how much to charge) to the controversial (involuntary hospitalization). The authors face the field's shortcomings head on, revealing what other doctors may not admit about practicing psychiatry. 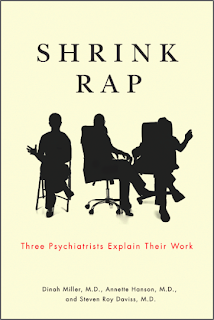 Candid and humorous, Shrink Rap is a bird's-eye view of psychiatry, peering into technology, treatments, and the business of the field. If you've ever wondered how to negotiate the complicated mental health arena, let Shrink Rap lead the way toward understanding how psychiatry really works. The Kindle version is now available at Amazon. If you came here looking for our blog of the same name (Shrink Rap), then click here to go to the blog. More in the mood for an audio thing? Here's the link to our podcast page and to our iTunes page. This is a terrific book! While a good review now (and I love the little personal insights about psychiatrists), I wish someone had given me and my family a copy when I entered the mental health system 40 years ago. It would have been an immense help. WELL DONE!! I just finished reading SHRINK RAP and have to say it is a most marvelous book. So much information. I have been dealing with psychiatrists for the past 20 years and now I know even more about the hard and fascinating work they do. I'm going to tell my present psychiatrist about it and hopefully we'll both be a little more enlightened. Thanks for writing it, it was long overdue.